Many parents have philosophical and/or financial concerns when it comes to rewarding their kids with money for helping around the house. 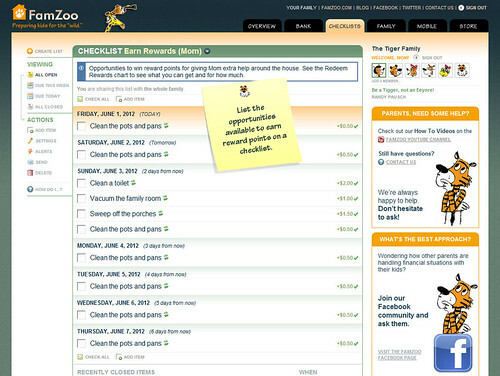 Did you know you can use FamZoo accounts and checklists to create a nice non-monetary, non-material reward system? You can even mix’n match it with a monetary system like allowance or paid chores if desired. Note: click on the images to view larger sizes. You can also view them in slide show format here. You’ll find a Create Account link in the footer of the Account Balances summary on the Overview page. Be sure to name the account something like “Reward Points” to emphasize that we’re talking about redeemable points here and not dollars. 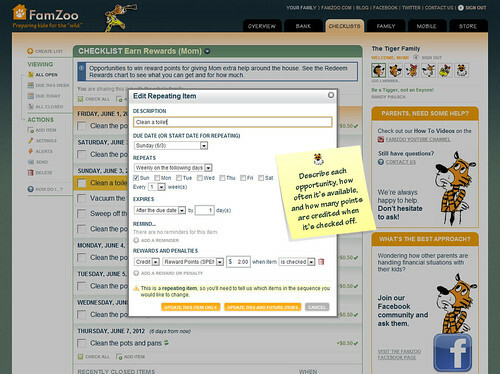 Head over to the Checklist page and find the Create List link in the upper left corner. 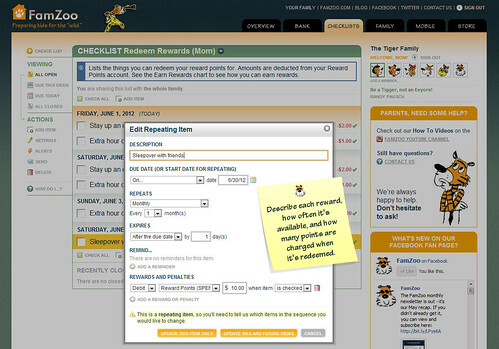 Create a list and name it something like “Earn Rewards.” Click the Add Item link to add each of the opportunities you’ll be giving your child to earn points that can be subsequently redeemed for rewards. For each earning opportunity you add — like perhaps cleaning a toilet — fill in it’s name and it’s repeat frequency to indicate how often it can be done. Don’t worry so much about what specific day it falls on; we’re really just recording whether this earning opportunity is available every day, one or more times a week, every other week, etc. (Note: To keep things clutter-free in the All Open view of your checklist, fill in the Expires setting to make sure old opportunities that your child never capitalized on just fall off the list after they pass by.) 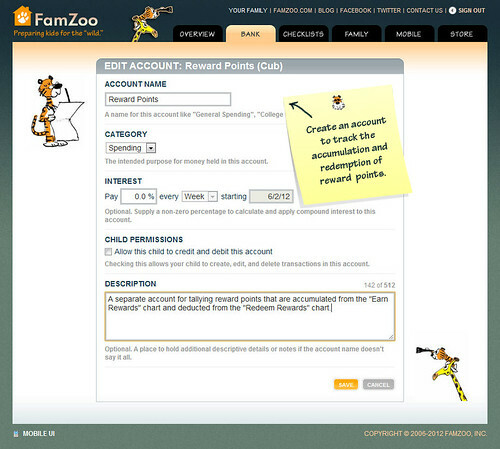 Assign a point total to be accumulated in your child’s Reward Points account. The absolute dollar amount doesn’t matter. What matters is it’s size relative to other opportunities and the total points required to cash in on a reward. You’ll be advertising those reward totals on the chart in the next step. 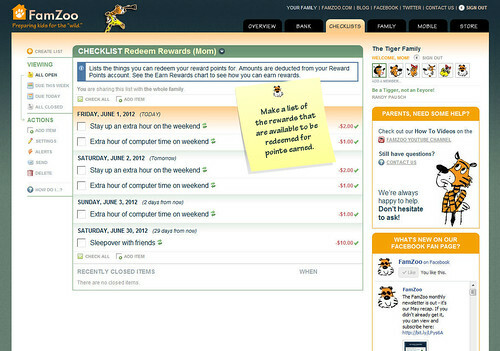 Create a second list that contains the rewards you’re willing to offer in exchange for points your child has earned. These can be items that may not cost you a thing, but are nonetheless very valuable to your child — maybe staying up an extra hour on a non-school night, getting an extra hour of computer time, or having a sleepover with friends. For each reward on the list, fill in its name, availability, and the total points required to get it. Now your non-monetary reward system is all set to go. When your child completes one of the items around the house, just check it off the “Earn Rewards” list to automatically credit the Reward Points account balance with the amount earned. When your child earns enough points and calls in a reward, just check it off the “Redeem Rewards” list to automatically debit the balance with the total points redeemed. 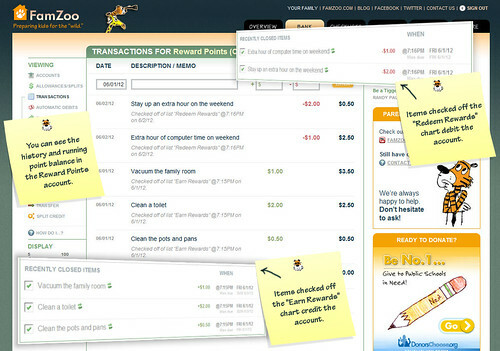 You and your kids can always see the current Reward Points account balance on the Overview page. When you click on the balance, you’ll navigate to the Transactions page where you can see a history showing each time your child earned and redeemed points, along with a running point total on the right hand side. How do you handle multiple children? Do you need to set this up for each child so they are not using a general account? Can you make the debit so that you have to select the account it is coming from when it is selected? Is there a way to regenerate the reward on the list as soon as it is selected with no end date? Yes, you make an entry for each child that maps to the appropriate target account. You can either put the entries on a common list and have the description indicate the specific child or create a separate list for each child. We currently do not have a repeat-when-completed repeat option, so you create a recurring reward with the repeat frequency set to the most often possible. Be sure to set the Expires field so old occurrences that are unclaimed harmlessly expire and don't clutter up the ALL OPEN view. Original post removed. Issue resolved.